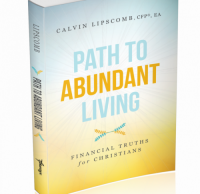 Let me say thank you for taking the time to checkout this page and my forthcoming book, path To Abundant Living: Financial Truths For Christians. The book is expected to be released sometime in late in July or very early August. I will keep you posted on the exact publishing date. The book does deal with certain issues that Christians have to come to grips with. However, you may find some of the thinking and attitudes may also apply to you. You will receive a solid introduction to financial issues and problems that should be navigated in order to successfully grow and prosper financially. Feel free to follow and like me on Facebook. By connecting on Facebook you will receive timely and important financial information that can benefit you and those around you.